Optimal conversion to a subcutaneous insulin regimen following an insulin infusion requires knowledge of patients’ current clinical status, medical history, and most recent intravenous (IV) insulin drip requirements. This up‐to‐date information is most available to a bedside nurse. We proposed that implementation of a nurse‐driven transition protocol would result in improved glycemic control when compared with the prior physician initiated process. The institution's existing insulin infusion orders were modified to include orders for transition. Patients off vasoactive medications and eating meals (or on goal tube feeds) or those with orders to transfer out of the intensive care unit met criteria for transition. Patients with an average infusion rate ≥ 1.5 units/h, an HgbA1C > 6.5, or known diabetes were transitioned using the following steps. The bedside ICU nurse entered the infusion rates for the last 7 hours into an electronic form, embedded calculations averaged the lowest 5 rates, and multiplied by 20 to determine the total daily dose of insulin (TDD). This was divided into 50% glargine and 50% rapid‐acting nutritional. The calculated doses then appeared within the electronic form. A retrospective review of all patients undergoing cardiovascular surgery during the 4 months before (n = 65) and after (n = 108) implementation of the transition protocol was completed. Glucose values from the time of discontinuation of IV insulin until hospital discharge were analyzed. The primary end points were the mean glucose, day weighted mean, the percentage of patients with hypoglycemia (<70 mg/dL) and severe hypoglycemia (<40 mg/dL), and the percentage of values between 70 and 180 mg/dL. Secondary end points included hospital length of stay (LOS), 30‐day mortality and readmission, and sternal wound infection. 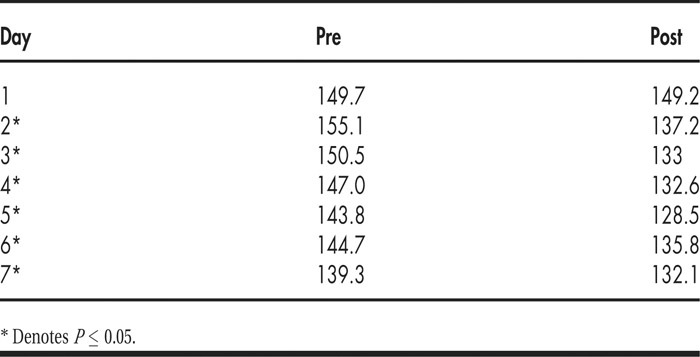 Improvements were seen in mean glucose (145.8 vs. 135.1 mg/dL; P < 0.001), percentage of glucose values between 70 and 180 mg/dL (77.3% vs. 81.7%; P < 0.001), and day weighted mean (Table 1). There was no difference in the percentage of patients with hypoglycemia (24.6% vs. 29.6%; P = 0.55) or rates of severe hypoglycemia (1.5% vs. 1.9%; P = 0.65). In multiple linear regression, transition group was a significant predictor of surgical LOS, with adjusted LOS 1.27 days less in the group following implementation of the transition orders. There was no difference in 30‐day mortality (none in either group), read‐mission, or sternal wound infections. A nurse‐driven protocol for the transition from IV to subcutaneous insulin resulted in significant improvements in glycemic control for cardiovascular surgery patients without increasing hypoglycemia. O’Malley C, Keuth J, Schiller K, Gerkin R, Bikin D. Improving Glycemic Control with the Use of a Nurse‐Driven Protocol for the Transition from Intravenous to Subcutaneous Insulin Therapy. Abstract published at Hospital Medicine 2011, May 10-13, Dallas, Texas. Abstract 89. Journal of Hospital Medicine. 2011; 6 (suppl 2). https://www.shmabstracts.com/abstract/improving-glycemic-control-with-the-use-of-a-nursedriven-protocol-for-the-transition-from-intravenous-to-subcutaneous-insulin-therapy/. Accessed April 25, 2019.